What would you do if you had more time to enjoy what urban life in the Nation’s Capital was all about? You’ll find out with the comfort, convenience, and connectivity of The Alta. Located between downtown DC’s business district and the popular Logan Circle neighborhood, The Alta features the latest in urban detailing: open loft designs, European-inspired porcelain tiles, stainless-steel appliances, and nine-foot ceilings with exposed spiral ductwork. There’s also a landscaped rooftop terrace and a second-floor lounge for you to either relax by yourself or entertain guests. Rising 13 stories high, The Alta contains 126 one- and two-bedroom condo homes of varying floor plans and places you just a few blocks south of great restaurants (including Le Diplomate, B Too, Birch & Barley and Thaitanic) and everyday conveniences (including a Whole Foods and a CVS Pharmacy). Living so close to downtown means you’ll be a nice, leisurely walk down 14th Street from iconic sites including the Washington Monument, the Lincoln Memorial, the National Gallery of Art, the White House, and the Smithsonian Castle. 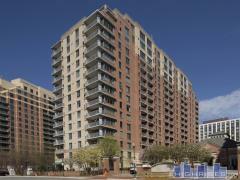 Have any comments or questions about Alta at Thomas Circle? Ask your question and/or share your thoughts about this Building.